We re-use old forms to make a new form for an upcoming event. to the competitor trying to enter. No problem there. shows the date of the old form. So, it is hard for me to recognize which event people are entering IF they are close together and that is happening. Do we have to make a "new" form for every event so the date comes over to me correctly or is there something we can do to make this change? I'm very new to all things like this. Please help. 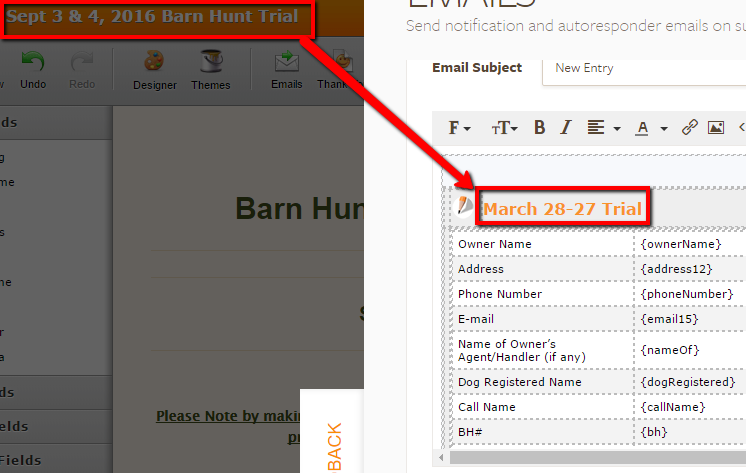 If you have changed a field or modified the title of the form, the notification will contain the old name and fields. You would need to update the notification manually or recreate it the notification. Deleting and recreating a new notification will capture all the modification made in the form.